I am a graphic designer and interactive designer by profession, I began my career in 1996. I received my Bachelor of Science in Art with a concentration in Graphic Design from Northeastern University in Boston. Elderly relatives would point out that my “B.S. degree” is just what folks get when they go to that art college. Having spent my career working for, and eventually starting my own, small company, I have had the opportunity to gain skills well beyond what a traditional designer or art director might require. As projects and budgets required, I have been an Web designer, animator, illustrator, copywriter, drawer of sarcastic cartoons, concept-thinker-upper, photographer, print production supervisor, and many more. Feel free to look around my Web site to see lots of this work. Looking for a resume or references? Just email a request to jeff@jeffthedesigner.com I’m sure I can find either or both. In fact, given time, I can probably come up with a resume that says just about anything. 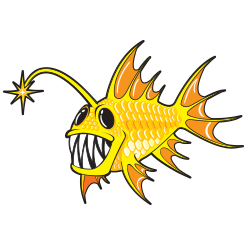 My golden fish logo began as a sketched abstraction of a number of deep-sea fish. I’m fascinated with the unusual creatures found in the deep ocean. I also have a runaway imagination for which there is no “off” switch, so I doodle this kind of cartoon when paper and pen are at hand. The fish sketch became an illustration, which is one of my many amazing skills. I then realized that this fish represented me and my work. It is unexpected, unique, memorable, fun, and unconventional. As an artist, I have the liberty to represent myself with a fun and interesting logo. If I ever open a law firm (perish the thought) I may have to draw a suit on my fish. I have posted many unpublished concepts on this Web site. Some were shown to clients along with other designs that were actually produced, others were working ideas that only I saw. These design concepts often represent my thinking about a solution to a creative challenge better than the published piece that resulted. Final, published, ideas are improved by input from co-workers, as well as being changed, reshaped, and sometimes even stepped on by interests having limited concern with the quality of the art. This is the reality of Graphic Design, but it does not always result in the best product. My original concepts, however, remain interesting to me and a true representation of my creative thought process.